One Colour Go (Japanese: mekura-go) is when both players play stones of the same colour, and have to remember which stones belong to which player. It really tests one’s memory as well as the ability to analyse the shapes in the game. 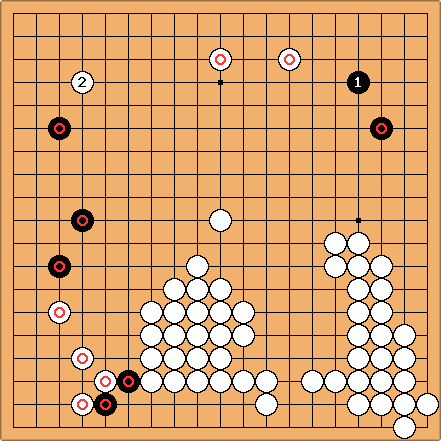 If you want to try it, Jago and SmartGo have an option that lets you make all of the stones on the board black. It can get confusing. --- HolIgor: Let's play. I will mark white stones that I suppose are truly white. --Stefan: I need a second goban to test some layouts. Madoka: I'm curious, do people actually play OCG in real life? If so how would one handle disputes? For example, when Hikaru played Kurata, both forgot the layout of the board. Kurata won only because Hikaru didn't call his bluff. bkhl: I guess you could mark stones of one color on the underside. Then you can check them if there is a dispute. exswoo:Unless my memory is playing tricks with me, only Kurata forgot the layout of the board. Hikaru resigned because he realized that he would eventually lose. victim I played both, as a 4d, against Philip Hiller who was 9k at the time. 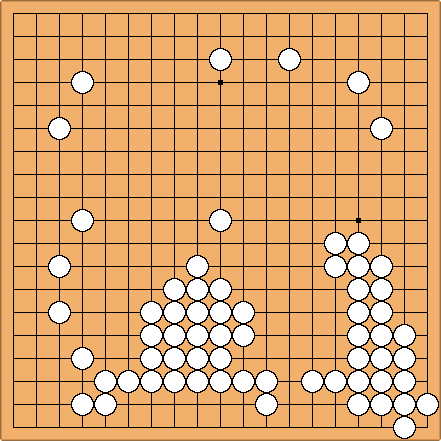 There was no such problem with the One-Colour Go. But we stopped the blind go after fifty moves. KyleC? One color go is possible if someone is marking down the moves as the two are playing. It usually reaches a resignation due to an oversite by one player.I have seen 2 games played in this way. Both times reached a resignation and both were played by low to mid dans. tappel? : I played a game of one colour go yesterday. It wasn't as hard as it would seem. I am 13 kyu and the opponent was about five stones weaker (we played with a 5 stone handicap). Eventually we played a jigo, and there was no dispute about which stones were played by whom. One thing about this variant that I noticed is that both players seemed to try to avoid complicated fights. GoJaC: I played a game of one colour against SteveKroon on 8 December. (I'm 10k, he's 5k.) It was quite an experience, played around 240 moves before I resigned when he killed a second of my big groups. (He killed one of mine, I killed one of his, then this one.) In the end we replaced all his stones with white and mine with black (we had a mix of stones on the table as we ran out of black ones), and noticed a crucial group was in atari. Killing that would have rescued one of the dead groups. We both made a couple of errors, corrected by a quick reminder by the opponent after the bad move's already been made - resulted in a couple of smallish captures and an incorrect ko threat granting life in a ko-for-life in the corner. After the game was finished, we tried to reconstruct the game, seeing if the constant-remembering helped remember the move sequence. I can't really tell how much it helped, haven't reconstructed many games yet, but when we started forgetting sequences or getting them out of order, we switched to reconstructing the final board position, which we found quite easy. The recollection methods we used were therefore probably not very move-sequence oriented, but more remembering how a certain "ladder" played out, or where the cut was and what shape developed from a threatened net, for example. It's not particularly good for working at "whole-board-thinking", at least not for me. Every time action shifts to another part of the board, we have to reconsider and figure out what exactly that part looked like again. The kind of errors we made possibly illustrated a kind of "laziness" to not figure out everything in the area. For example, the group in atari - that was in the middle of a complicated fighting area. To the onlooker it looked like one really scary huge dango, like these things tend to look in one colour go (as above). Disputes were easily solved with a little discussion (just a little reminding really). Nick George: How does one go about playing One Color Go on KGS?